We’re stoked to be working with LinkedIn, the world’s largest professional network, to help you get noticed for your hard work on Coursera! If you are one of the hundreds of thousands of Courserians who have finished a course, you can now instantly add your Verified Certificates and Statements of Accomplishment to your LinkedIn Profile. 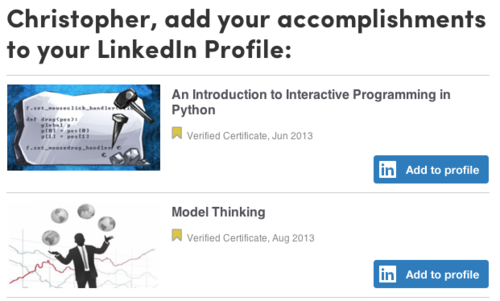 Students will receive an email about their finished courses with a reminder to add these accomplishments to LinkedIn. Open the email and click the “Add to Profile” button and voila –you’ve just added your profile Course to your LinkedIn profile! Even better, if you earn a Verified Certificate, your LinkedIn Profile will automatically link back to your official record on Coursera! An important dimension of our work at Coursera is to raise the bar for continuous learning and achievement, which opens people up to new opportunities, skills and knowledge at any stage in their careers or lives. With LinkedIn, we are now able to give students the opportunity to easily update their online professional profiles to acknowledge their Coursera accomplishments. 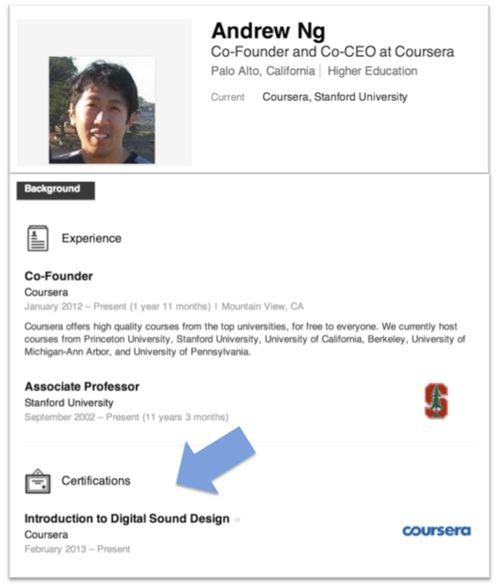 Even our Co-Founder Andrew Ng has added his in Introduction to Digital Sound Design from Emory University to his profile!